I'm Squirrel Liss. I became the hero of today's contest. The writers of the contest are snuke, hogloid, DEGwer, and rng_58. I'd like to thank Gerald for helping preparation, Delinur for translation, and MikeMirzayanov for the Codeforces system. The point values will be standard: 500-1000-1500-2000-2500 for both divisions. I will encounter many difficulties about stones, nuts, and sequences... Please help me! UPD: Announced the detail of the contest. Also congratulations al13n and Komaki for solving div1 E problem. UPD: Tutorial was added here. I smell a lot of math. WOW...I guess it would be a VERY hard contest...And I'm really looking forward to rng_58's problems :) so I'll take part for sure :). I think it was because of the change in schedule. It is not announcement. Announcement will be later. This contest will be very hard...but it will be very good(I want to participate in Div1,but I will not be able to participate because my rating became less than　1700...). do you often practice out of contests times? He solves problems very VERY fast! Actually hARRAY is my original hadle... Check that out and give advice dudes! Practice is the only key to improve...Try to solve the problems after the contests and read the editorials if you face any problem. Also if editorials are not enough for you to understand then you can take help of the blogs. looking forward to a topcoder admin's problem. :) I won't miss it. I think he meant rng_58 . Though I am not sure admin would be the right word. i am not able to register..can u please help be understanding why is this so.. There are 8 more hours(from now) until registration is made possible. Комментарий удален администрацией по причине несоблюдения правил сайта. This will be the contest with the best problem set and the best plot :) . good luck & have fun ! Хочется, чтобы Белочка Лисска почаще составляла контесты! Всем удачных взломов и повышения рейтинга! I guess that there are many kinds of animals in the statement because they are Japanese writers. I like wolves!! So I wish the problem set would contain problem about wolf!! And today is Sunday, and time of session in uni.
? what does "meng" mean? its mean is like moe? "meng" is the pronunciation of the Chinese character "萌", while "moe" is written as "萌え" in Japanese. could not catch the registration... what a pity! What's wrong with the statement? Yes, it might be hard to imagine it, but try drawing it — that should make it clearer! Edit: Besides, apparently more than 900 people didn't have a problem with it. Half the time the room is down. Very slow.Unable to hack. disappointed. I drew a 2D matrix and looked at all unreachable cells (you can either go to (x+1,y)/(x,y+1) or to (x+1,y+1) only). Then you have pretty beautiful answer. Very nice problems, thank you! Of A, B, C, D (haven't had time to try E) I especially liked D.
why i always receive a message from this online system that 'Can't process your hack, try again' when everytime i try to upload a file to hack. Anyone could help me about this question? I couldn't make any hack today , whenever I try to drag the hack screen it select the text and it's undraggable, whenever I scroll down , the screen scrolls down with me , in the previous contests the hack screen was draggable i don't know why it's undraggable today , did anyone else face the same problem ? Thank you, I'll try this next time :) but don't you think that this bug should be fixed ? Very cool D! I didn't solve it (I know my bug), but it is real cool! I think "TAT" means crying.. AWESOME PROBLEMS . Too bad i got hacked twice, but ... Nice, nice problems, though . Congrats ! I get Invalid input for problem B hacking with 100000 1 2 ... 100000 input, but 99999 1 2 ... 99999 was OK once, on the second try it gives Invalid input too. It's weird. Can I have some help in solving C? I keep getting WA on pretest 8 and I'm not sure why. Let f(i) = best value we can get if we choose a subsequence with last ball being the i^th ball. It's also interesting that all problems in DIV-I have a constraints at least N>=10^5. 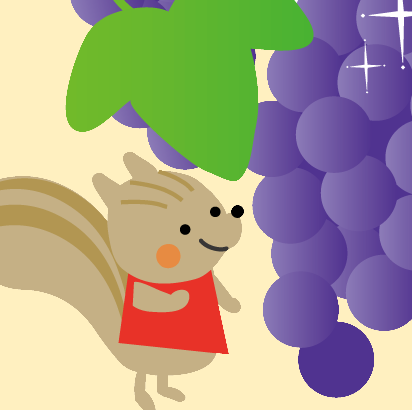 By the way, why Liss is looking at grapes(but not nuts) in the picture? And before the contest I guessed that there might be some constructive problems (e.g. : http://www.codeforces.com/problemset/problem/198/D): they can't be used in TopCoder either. nice problems. even the writer are Japaneses, the problems are not too mathy. I hadn't a time to solve E, but I've just noticed that hi, xi ≤ 10 (after half-hour thinking). IMHO, you'd better state this very important constraints in description, and not in the 'input' section next time. I suppose that .Length is not O(1) and is O(N), hence your solution is O(N^2) due to that fact only. You're wrong, length is a class string property, and work in O(1).. Yes, indeed. Well that was only an assumption. it ran a lot faster on maximum test case. So what do you want me to do? What I used above is a small buffer to avoid 10^6 calls of Write/Writeline with newlines at some reasonable cost of string operations. Note that I haven't made one big resulting string (as in your two solutions), as it would give TLE anyway. Actually, it's pretty believable. The time of accepted solution is exactly 2000ms, and since the same program can run slightly different time every run, it can easily either pass or fail when it's at the borderline. It seems to me that tests and limits for C should be more accurate. The result should not depend on checker pass. Offtopic: am I the only one who can't click on the link above in cgy4ever's comment? Firefox 18.0.1, Windows 7 x64 En. I can open it too. Can you open it by clicking on it? I could open it with no different from opening other comments. Anyway it's a good contest, maybe you could reduce the amount of big test in problems to reduce the running time. Excessive modesty from a red user. I don't think I deserve that rank and rating... I am just that type of programmer who just solve a lot of problems so if I see a similar problem I can solve it quickly. But if I meet a problem which is not that standard, I just, well, kind of feel like that I'm indeed a noob . You can see from my profiles that whenever I got a nice rank, the contest's problems are standard to some degree, if the contest require some deep thoughts about something, I always fail. Anyway I know it's bad to think that negatively, I'll try to solve more problems of that kind to practice my brain :). When you meet a new problem and start thinking that you're a noob, your creative thinking goes down as a consequence. It's a closed circle. What is the limit of characters in a hacking attempt ?? I try to hack the C div2 problem with a string of 10 ^ 5 'l' and 10 ^ 5 'r', ie "llll ... rrr ...." wanting to do a TLE but the result I get to send a string of size 10 ^ 4, and an attempt to hack wrong. You can always upload a generator. Just upload the source file. In problem C O(n) is giving TLE. inserting in a vector is O(1) amortized, which means N number of insertion takes O(N). Insertions??? To any place, using res.insert(res.begin()+pos,i+2);??? Maybe you mean push_back-s are O(1) amortized?.. If you really mean insert-s are O(1) amortized, please explain how can it be so. To your comment does not prevent people understand the principles of the STL, I will explain more precisely. Inserts the item at the end of the vector = O (1) (amortized). What happens under the hood when we insert in the middle or beginning of the vector? Suppose that the insertion occurs at position n. Then the elements from the position before the end of n is copied and transferred to the one to the right. Total O (n). I have found many participants have this error ~~~~~ for (int i = 0; i < s.size(); ++i) ~~~~~ and I think the correct is ~~~~~ int len = s.size(); for (int i = 0; i < len; ++i) ~~~~~ you can find the reason. (forgive my poor English). |s|<=10^6 and for this you need tu calculate 1/2^(10^6) and there precision will lost. Oh, I've gotten!what a bad mistake! :(( So, in this case, what is the algorithm to solve this?? What's wrong with system testing ? It took a single contest time. I just want to try my solution but I have to wait the systest that very long. My first contest in the first division and I solved two problems. Looks pretty nice to me :). I want to know how the solutions are hacked during the contest because I think the solutions of other candidates are not visible till the end of the contest. You need to lock your submission on the overview page before you can see and hack other solutions. By locking them you won't be able to resubmit again, and your submission must pass pretests for you to be able to lock it. Separately, thx to DEGwer for the div.2 C problem — very interesting. Why ivan.metelsky's A got TLE? Задача С ужасная: идеи никакой не нужно и как-то несерьёзно, что TL зависит от оператора вывода и компилятора. Почему же, идея в том, что нельзя было вычислять середины отрезков и складывать в массив пары <координата, номер камня>, потому что длина строки — миллион. И тл там больше зависит от работы контейнеров stl, по-моему. нет, один и тот же код на gnu c++ заходит а на ms c++ tlится. это ненормально, по-моему. Как раз скорее разница в контейнерах у них. На одной из олимпиад у нашей команды не зашло решение на gcc, но проходило (как впоследствии выяснилось) на msvc. Просто нужно понять — компиляторы разные. И нужно знать их особенности. ItsLastDay выше всё сказал абсолютно правильно. Было бы странно, если бы любой код под обеими компиляторами работал одинаково, не так ли? Например, знаете ли вы, что в g++ по умолчанию вектор при реаллокации увеличивается в два раза, а в msvc++ — в полтора? да елки палки! была уже статья про использование stl, статистика и все такое. Там наглядно показано, что stl- это хорошо, ничего там не тормозит. А если кто не использует reserve/resize — так это их проблемы. а задача реально безидейная, а AC зависит от выбора компиля. Сам на это наткнулся. А что за статья? Про вектор на сколько я помню было в комментах много обсуждений, что хорошо, а что нет. И что их все-таки лучше не юзать, когда есть возможность. AC зависит от выбора методов ввода/вывода, уж сколько раз твердили миру, что cin/cout == тормоза, а endl — еще дополнительные тормоза, т.к. он флашит поток. Может, для кого-то будет уроком. P.S. по поводу топика погорячился. Там рассказывалось про stl'евские пары. Тут дело скорее в компиляторе, а не в скорости ввода/вывода в C++ в целом. На GNU C++ нужно было постараться, чтобы получить TL по этой задаче просто из-за того, что неправильный способ вывода выбрал. По крайней мере моя посылка с cin/cout, endl и без выключения синхронизации с stdio уверенно заходит. Ладно, предлагаю на этом закончить спор. В конце концов каждый останется при своем. А по задаче — на то воля автора. Probably because the task was made so a solution using most binary trees (which are generally efficient asymptotically, but slow in real time) would get TLE. The idea itself was incredibly simple (2 stacks), so the time limit was probably out of reach with a binary tree structure. if(i == strlen(s)) — probably, strlen is computing on every step, which results in quadratic time. Someone explain me please, how to solve the problem "Good Sequences" (D div2 and B div1)? Let's compute d[x] — the length of the longest sequence with the last element (you don't need it's actual value) divisible by x. Suppose you already have some sequences, and you have array d as the information about them. And what you want is to know what sequences can be extended if you add number r at the end of them. Those sequences must end on some value, which is divisible by some (> 1) divisor of r. So to update the answer you just iterate over all divisors of r (that can be done in sqrt(r) time). Actually, you can ignore any non-prime divisors of r, however, that is not necessary. In fact it can be done in O(nlogn) time using a preprocessing with the sieve of Eratosthenes. UPD. ...and this will make his/her solution a bit faster disregarding the same asymptotic complexity. But it doesn't change the complexity. In fact sieve works in O(nloglogn). But you must always check divisiors of r (and it takes O(logr) pessimistically). That's why the whole complexity is O(nlogn). The sieve of Erathostenes can be optimized to O(r). Checking of prime divisors takes O(number of primes <= sqrt(r))=O(sqrt(r)/log(r)). (If r is a large prime or a multiple of 2 primes close to sqrt(r), for example.) But there are at most lg(r) distinct prime divisors (actually, even less — for the given constraint r <= 100000, it's at most 7 as opposed to ceil(lg(100000))=17). So that'd give a total complexity of at least O(n sqrt(r)/log(r)). Sorry for stupid question, but can author/admin publish test #5 of Div.1 C? There is int overflow in 3 places in your code. values[i]*a and values[i]*b aren't necessarily fit into int. You can try to write a naive solution and use it to find some small test case on which your solution fails. Could anyone help me? Something strange has happened. My solution on A got TLE at the contest, but when I submitted the EXACT SAME code after the contest, it got accepted with the time of 717ms! (TLE:2964261 / AC:2974157) What happened? I didn't notice that. Thank you very much. Blue again :) ! I really liked the problems :) ! And the plot was very cool too ! Thanks a lot for this great contest :)! Can't make it pass by using Ruby or Scala. Very easy to pass in Java. :( Looks like Ruby or Scala are not encouraged. Anyone knows why scala is so slow on codeforces? It's supposed to be a fast language. I will write editorial in English soon. You need max in the same color and max in other color. So, if overall max is in this color you need another (second) max. This one of the best programming community I ever seen. While going through each archive contests, I am getting a plenty of new ideas. Hat's off to the Authors and Contestants. The problem statement says that finding the minimal time to eat all nuts so the answer should be 16 (first tree -> third tree -> second tree), but the answer of tutorial is 24 (first -> second -> third). Or I don't understand this problem correctly ? Sorry for my bad English. Thanks! Server time: Apr/19/2019 01:36:02 (f2).